Can you give us a teaser of what you'll be presenting as part of the Starting Blocks showcase on 30 March? Brothers of Justice are the alter egos of performance makers Lawrence Speck and Joe Wild. 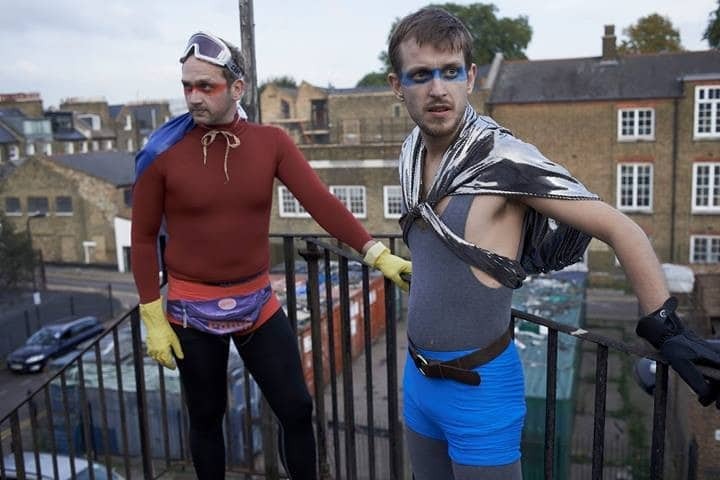 The show itself is inspired by the work of the growing community of men and women who dress up in costumes and take to the streets to fight crime. The Real Life Super Hero movement is tragic yet optimistic, it is funny yet valiant. Are we an apathetic generation? What power and responsibility does the individual have within a global community? How have you been developing the show over the past weeks? The Brothers have been launching themselves into the real world, compiling scientific research, creating dance routines, developing their manifesto and making costumes. In 5 words, what can the audience expect to look forward to in your performance? In 5 words, how would you describe your style of performance? Lecture performance, dance, documentry, rambunctious, insightful. You can see Brothers of Justice in the Starting Blocks Showcase on 30 March.